In 2009, Dysport—another neurotoxin similar to Botox Cosmetic—was approved by the FDA for cosmetic treatment of glabellar frown lines, as well as a medical indication called cervical dystonia. For cosmetic purposes, Dysport works as a neuromuscular blocking agent to reduce frown lines and can be injected just like Botox Cosmetic for the same indications noted above. However, there are a few important differences. Among these is a very significant difference in potency and biological activity based upon how the product is diluted. Therefore, as with Botox, it is important that the injector choose proper dilution and injection techniques to reduce the ability of the product to produce unwanted side-effects such as a diffusion beyond the site of intended injection. Dysport shares the same contraindications for usage as Botox. In addition, an allergy to cow's milk protein is another contraindication for use of Dysport. As with Botox Cosmetic, Dysport will prove to be effective for treatment of hyperdynamic frown lines for about four months. Xeomin injections are also performed by our doctors, in addition to Botox Cosmetic and Dysport. Xeomin (incobotulinumtoxinA). 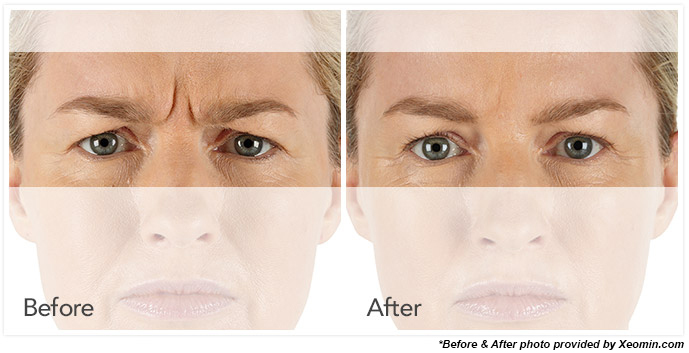 It is an injectable botulinum toxin indicated for the correction moderate to severe frown lines and wrinkles. Similar to Botox Cosmetic and Dysport, Xeomin injections begin to act in about three to five days, and effects last about four months. Xeomin injections can be used for the same areas and conditions as both Botox Cosmetic and Dysport, and cost is identical to both products. For more information concerning Dysport & Xeomin Injections from Facial Plastic & Laser Surgery Center, or to schedule your personalized appointment, please call us 309-589-3223.